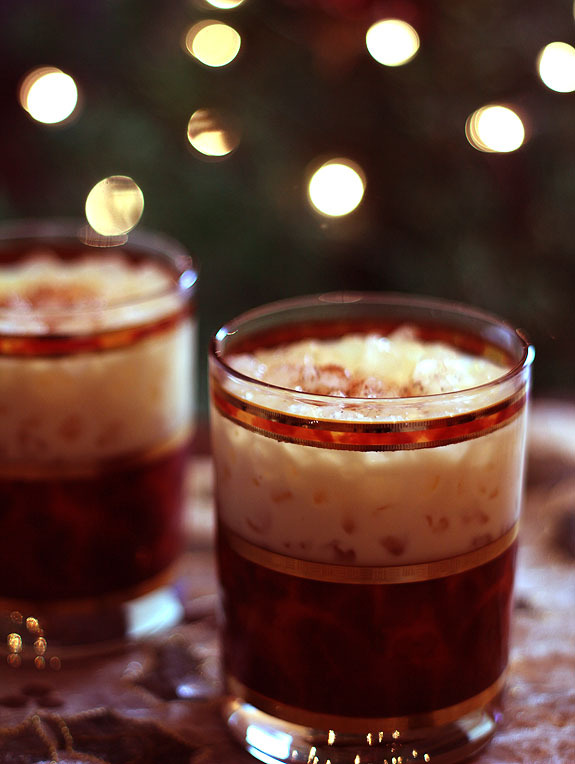 I’ve long had a holiday love affair with the decadence of Kahlua and Cream; it was the first ‘adult’ drink I was served in the safety of my parents home on Christmas Eve. I didn’t have the typical adolescent tendency to want to get drunk before I was old enough to legally imbibe but I will admit I loved the taste of that concoction. Moving beyond a Shirley Temple was exciting and the richness of Kahlua and Cream was a pretty easy cocktail to transition to. It was also perfect for the night before Christmas when family were together and there was always such a spirit of celebration. I’ve loved it ever since. 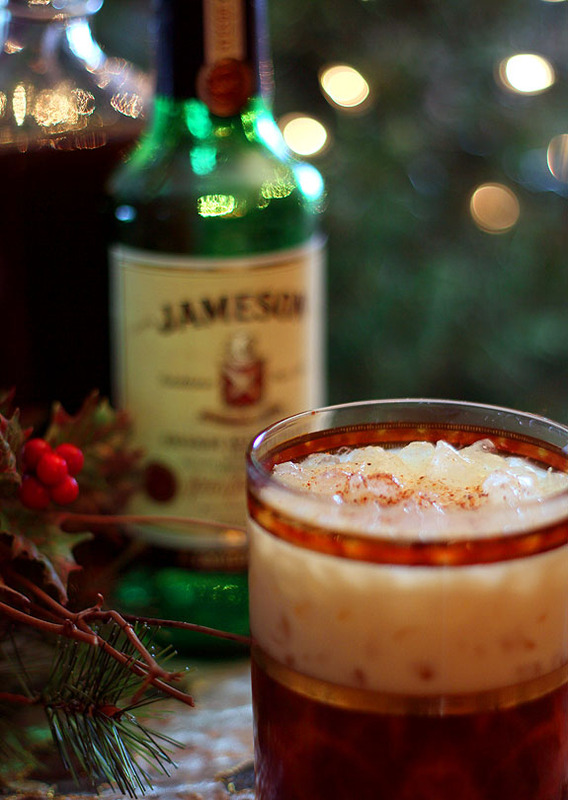 The path to making this Kahlua Eggnog and Jameson Irish Whiskey Cocktail did not take much effort at all. Over the years, my favorite cocktail has gone through several iterations, mostly from happenstance. I seriously doubt that moving from half and half to eggnog came about because of a studied journey into developing something unique. More likely, I’m imagining it was something simplistic like finding myself without half and half but locating eggnog in the fridge; very much my personal methodology. I will substitute something in a heartbeat if it means I can avoid a trip to the grocery store! No matter the segue; Kahlua with eggnog soon became my holiday cocktail tradition for Christmas Eve and that tradition served me well for many, many years. My most recent iteration was another moment of having to make do. Some friends had dropped by for a cocktail on Christmas Eve a couple of years ago and they knew to expect a Kahlua and Eggnog with some of my favorite cookies. But in one of those moments of panic, as I went to make 4 drinks, I realized I had erred grievously; my Kahlua was close to gone and I was lucky to wring a couple of ounces out of that bottle. My zeal for substituting forever at the ready…I glanced through what I had available. Here was my thought process. I love Irish Coffee which is coffee with Irish Whiskey and whipped cream. I surmised that Kahlua, Irish Whiskey and eggnog would be in the same vein so went about concocting a new version of my stalwart holiday cocktail. The bit of Irish in me was sure OK with it and the response of my guests only solidified that until something necessary stipulates another revision; this is a winner that I hope won’t change for several years! Fill cocktail glasses with crushed ice. 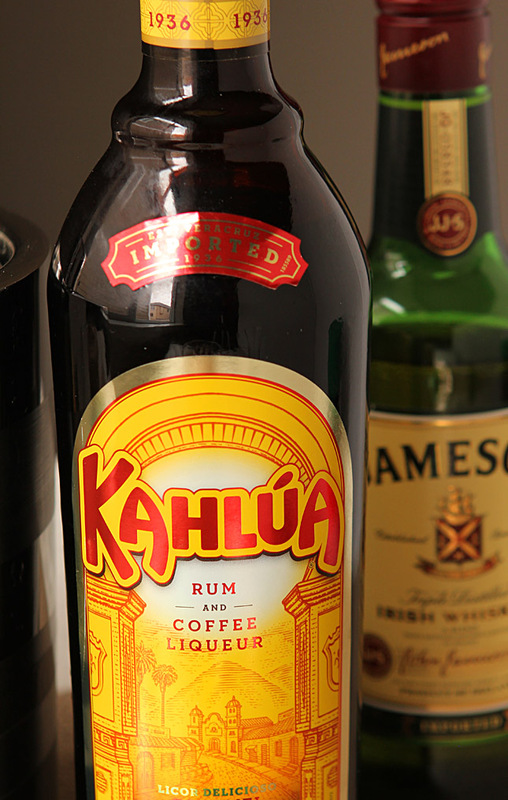 Put the Kahlua, whiskey and eggnog into a cocktail shaker and mix thoroughly. Pour over ice and top with freshly grated nutmeg. Mmmm does Rachel’s eggnog recipe sound decadent and fabulous! And kahlua and cream? Never one to look to getting drunk, that was really the perfect drink for a sweet tooth during my college years! It was perfect; I had friends with some children over one evening. Kids could drink it and we could doctor it! I couldn’t live without my freshly grated nutmeg. How fun that you will be making a cocktail once a month. I’m sure the practice will be fun. 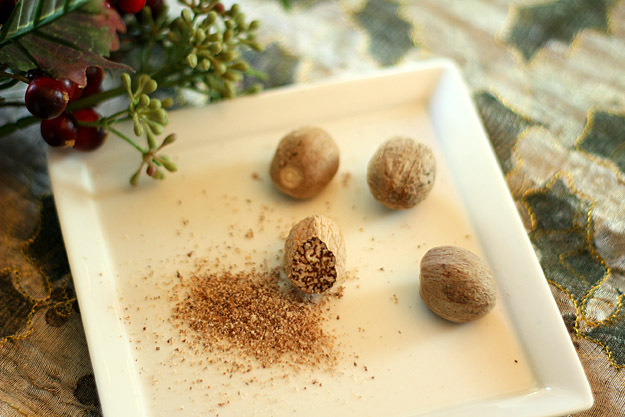 Isn’t fresh grated nutmeg just the best? Such a different experience from the bottle from the spice isle. As always beautiful photos Barb. Good to see you at brunch and I want to thank you so much for the oil. Haven’t used it yet, but look forward to reviving my wood boards and tools. This is the kind of cocktail I drink too many of during the season. And nutmeg does indeed make it all better. Happy Holidays! I love hearing about everyone’s traditions; how foods are so important to the memories we all have. I think I need some Glogg! Holy Booze! I want some! I’ve got plenty here next to the Rocky Mtns. Saddle up your horse and come on over! I love that this is worry free; not quite as ‘eggy’ as others but with the other ingredients in this drink; it was perfect. I loved it. Barb, these photos are really amazing! Just gorgeous, you just want to drink it right up! And I really get the feel you had at home with your family for the holidays.ah….memories. Excited to see you working with the Daily Basics, I will go check out your drink recipe right now. The Eggnog looks quite divine on its own! Thank you Wendy…some days I feel I’ve found my groove and then I will take some that are terrible…so much to learn! Love the term, Droolicious and will have to remember to use it, with or without my fave, yummalicious. The Fuji eggnog sounds rich and delicious. I do believe my name is necessity Paula; firm believer in use it up and wear it out too! There is always something I can find to make do! Thank you so much…very sincerely appreciated. this sounds so yummy and festive! thank you for sharing this. Absolutely…I only wish I could share a cocktail in real life with everyone! Thanks Priscilla; I am going to reward myself with one of these soon. House cleaned, tree up, living room decorated and most stuff ready to be mailed tomorrow. Long day deserves a nice drink I’m thinking! Ah, I was wondering what was sprinkled on the top of the drink. Nutmeg. This drink sounds excellent. Yes…and I will use a jar of nutmeg for some thing but just have to use freshly grated for eggnog drinks. Barb, that first photo is delicious. Yum! Headed over there to check it out!